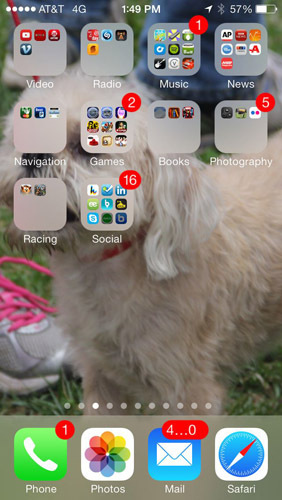 If you have a big appetite for iPhone apps, keep them organized in folders to prevent agita. Finding the single app you want to use among 15 screens of apps is daunting, but Apple felt your pain and added a handy organizational tool called Folders. The Folders feature enables you to create folder icons, each holding up to a dozen apps. You might want to create folders for social apps, photography, travel, and any number of other categories. Press your finger against an icon until all the icons on the screen jiggle. Decide which apps you want to move to a folder, and drag the icon for the first app on top of the second app. Optional: To rename the folder, tap the X in the bar where the folder name appears and substitute a new name. To launch an app that’s inside a folder, tap that folder’s icon and then tap the icon for the app that you want to open. You can drag apps into and out of any folder and, with iOS 7, you have plenty of room. Indeed, you can stash up to 9 apps per page in a folder and have as many as 14 pages. That’s a grand total of 126 (which is probably far more than you’d ever want to tuck away in a folder). If you drag all the apps outside the folder, it automatically disappears. Folders are a great organizational tool. But if you have numerous apps on the phone, it’s a lot easier to create and arrange folders not from the phone but when syncing your phone in iTunes.